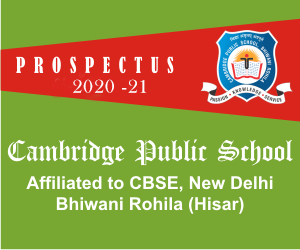 Cambridge Public School is a co-educational,English medium school from Nursery to XII, affiliated to C.B.S.E. The school is run by Cambridge Education Society which is fulfilling the requirement of the people of surrounding areas. It is located in Bhiwani Rohila (Hisar). The school is spread over 6.5 acres of land. It has open and spacious building with all the modern and latest facilities. It is a co-educational school in Hisar, Haryana, India, founded in 2007. Cambridge Public School comprises a school building which has 45 class rooms including Lab facilities ,Library,Activity Room. The school is designed in such a way that fresh air and sunlight reaches to every corner of the building. The building is Octagonal in shape with a open lawn in the centre. The building has all the modern facilities like R.O. purified water supply, Cold water facility in summer, Ramp for disabled student. It is established to fulfil the requirements and needs of the rural population and definitely it has been fulfilled the requirements and needs for the last 8 years. It has very beautiful lawns and gardens. The motto of the school is enshrined in the English Knowledge, Service and Passion which means 'The Light of Knowledge Is the Light of Life'.And a keen desire for learning. Our school provides ample opportunities for students to blossom into well groomed personalities with a fine balance of intellectual, emotional and spiritual quotient. The school has constructed a Hostel Facility to accommodate approx. 50 students. The hostel building is ready for the academic session 2015-16. The school has water harvesting plant which collects around one lakh cubic litre of water in a cemented water tank. In the previous rainy session we collected around 50 thousand cubic litres of water from our school building. The water is enough for our garden requirements for coming three months. The school campus has approx 10000 sq. feet of area for play ground.